LDR | Mainline Conveyor Systems, Inc. 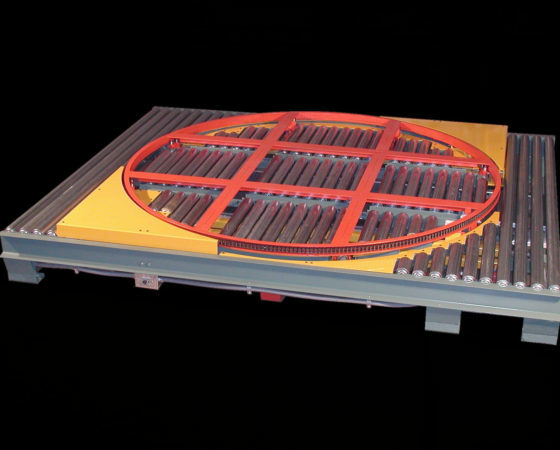 The Load Rotation Device (LDR) is a special device that reorients a unit load on the conveyor. The rotation device itself consists of the rotation means, the lift frame and it’s lifting mechanism, and a fixed frame. The LDR may act as part of a modular conveyor system, or as a stand alone unit that includes it’s own conveyor drive means. The rotation means consists of a ring weldment with four cross members that support the load during rotation. The ring is supported and guided from the lift ftarme by a series of rollers. The ring is encircled by a power transmission chain that is pulled by a sprocket and gearmotor that are supported by the lift frame. The lift frame is supported by air actuators that raise the rotation device and in turn lift the load when compressed air is introduced. This lift mechanism is controlled during the lifting by a load stabilizing mechanism attached to the base frame that prevents uneven lifting. The fixed frame supports the load carrying rollers and the pressure rollers that support and engage the conveyor drive belt. The center rollers and full length rollers at either end of the device are driven by the belt and in turn move any loads along the conveyor when engaged.